We’d love your help. Let us know what’s wrong with this preview of Once Upon A Murder by D.E. Dennis. In the town of Castle Rock, many residents live a fairy tale life but not all get a fairy tale ending. 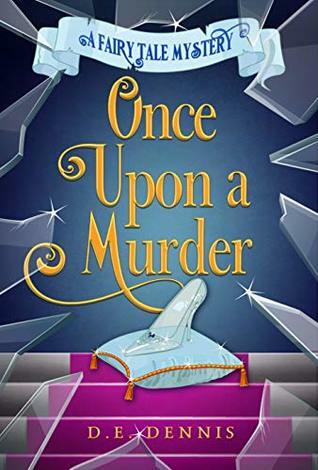 To ask other readers questions about Once Upon A Murder, please sign up. It's been a slow time for those at Grimm Investigations. Brother-and-sister team Michael and Monica just landed a new case. The teenage son of one of the wealthy families has just turned up murdered. The Charmings have hired Grimm Investigations, much to the chagrin of one of the police officers, Gutierrez, who never liked Michael. Castle Rock is a town of haves and have nots. Who would want to kill the Charming’s son? Will the PIs and police be able to work together? The book had more than the c It's been a slow time for those at Grimm Investigations. Brother-and-sister team Michael and Monica just landed a new case. The teenage son of one of the wealthy families has just turned up murdered. The Charmings have hired Grimm Investigations, much to the chagrin of one of the police officers, Gutierrez, who never liked Michael. Castle Rock is a town of haves and have nots. Who would want to kill the Charming’s son? Will the PIs and police be able to work together? The book had more than the common issues with grammar, punctuation, and usage. The typical comma issues were a problem; there were rarely commas between independent clauses in a compound sentence, and commas after an introductory phrase were often missing. The words who/that were used incorrectly. I don't typically notice adverbs and adjectives, though the former are often decried these days, but the beginning of the book seems to have an excess amount of these modifiers, which slowed reading. That said, the book has some funny moments that one looks for in a cozy mystery. I’m a sucker for a story with good family dynamics, and I loved the relationship between the Grimm siblings. There were fairytale in-jokes. I like that the brother and sister PIs were from the Grimm family. That definitely helps set up the concept of the series. After all, any manner of fairytales could be exploited under the Grimm name. Michael and Monica Grimm own Grimm's investigation. The first murder case comes when Preston Charming is killed in the most interesting way. It takes all they have, but the siblings soon find the culprit. What they didn't expect was the trail of deceit, lies and sadness left by Preston Charming. The story is interesting, charming and cozy. It has some small, interesting, mentions of fairytale personages but it isn't a fairytale. It is quite unique and appealing to teens and adults alike. It discu Michael and Monica Grimm own Grimm's investigation. The first murder case comes when Preston Charming is killed in the most interesting way. It takes all they have, but the siblings soon find the culprit. What they didn't expect was the trail of deceit, lies and sadness left by Preston Charming. The story is interesting, charming and cozy. It has some small, interesting, mentions of fairytale personages but it isn't a fairytale. It is quite unique and appealing to teens and adults alike. It discusses some adult topics but in a tactful way which attracted me a lot. The book could use a bit of editing to make it shine as much as it deserves. Still, here we find a great read for the entire family. Love the cover by the way, it depicted the story quite well. In this book, loosely based on different fairy tales, private investigators Michael and Monica Grimm are hired to find out who killed Preston Charming, only son of the second richest family in Castle Rock. The Charmings live in a gated community called Fairy Tales, a clear delineation of the have and have-nots. It's a typical tale of a wealthy kid who everyone seemed to like but who had his share of dark secrets, and his parents, who want the killer found without having anyone mucking about in t In this book, loosely based on different fairy tales, private investigators Michael and Monica Grimm are hired to find out who killed Preston Charming, only son of the second richest family in Castle Rock. The Charmings live in a gated community called Fairy Tales, a clear delineation of the have and have-nots. It's a typical tale of a wealthy kid who everyone seemed to like but who had his share of dark secrets, and his parents, who want the killer found without having anyone mucking about in their private lives. The story is strong and the fairy tale references are not overdone. The characters are believable and the dialog is smooth. I really liked it and look forward to the next book. Ella's step mom is not so wicked, but maybe a little out of it and in need of some substance counselling. Preston Charming is no prince, more of a user, and pretty unkind to several of the women in his life. The Grimm siblings are brother and sister, not brothers, and they work together to solve mysteries and create mayhem. So how do the siblings Grimm solve the murder of young Preston Charming? together, with help from their friends - and support from mom. Sad, sweet and pushing readers to re-thin Ella's step mom is not so wicked, but maybe a little out of it and in need of some substance counselling. Sad, sweet and pushing readers to re-think stereotypes. a powerful KU read! I received an advance copy from Booksprout. I really enjoyed the exploits of Michael and Monica Grimm, a brother and sister PI firm. I can’t wait to read more and learn more about their background. Hints of their past have got me wanting to due a little sleuthing! It was a fun and fast read and I totally guessed the wrong killer and reason for the murder. I’d make a terrible PI! But the book was great and I look forward to reading more of the series. This was such a clever idea to take fairy tale characters, plots, and themes and turn them into a mystery. Everyone is a suspect. No one is free from scrutiny. I truly enjoyed this book until the very end. This is a must read. I really enjoyed this book. It’s full of action, mystery, suspense and a lot of good hearted moments. The characters are great and the story came together nicely. I hope to learn more about the Grimm family’s past in future books. Now, she spends her time traveling the world and visiting new (and real) places and cultures as her love of being transported to another place only grew as she go D.E. Dennis grew up in the United States but has spent most of her life within the pages of a book. A great novel has the ability to transport you to another time or place and she loves all the worlds she has had the opportunity to visit.